Download vCard for Manuela Finger, LL.M. Munich is a hub for the high tech and life sciences industry in Germany, with our Intellectual property (IP)/IT/Commercial team providing leading edge advice. IP is a major area of strength for our firm across the globe, with Gowling WLG Munich being a key part of our international offering. We are highly recommended for patent litigation in all areas of technology, with corresponding strength in depth in the fields of trademarks and unfair competition. Across the full range of IP rights our team in Munich provides first class legal advice to an international client base. Located close to the European Patent Office (EPO), the German Patent and Trademark Office (DPMA) and Divisions of the future Unified Patent Court (UPC), international businesses can trust us when it comes to asserting their intellectual property rights. The office is also recognised for its expertise in food and drink law and delimitation issues to other regulated sectors in the life sciences industry. Take the S-train "S8" towards Herrsching and get off at "Karlsplatz". Take the exit in the direction of "Elisenstraße/Lenbachplatz" and turn right to "Lenbachplatz" until you reach "Pacellistrasse". Here, turn right to "Rochusstrasse" and you will see our office at Prannerstraße 15. Take one of the S-trains in the direction of "Ostbahnhof" and get off at the next station which is "Karlsplatz". Take the exit in the direction of "Elisenstraße/Lenbachplatz" and turn right to "Lenbachplatz" until you reach "Pacellistrasse". 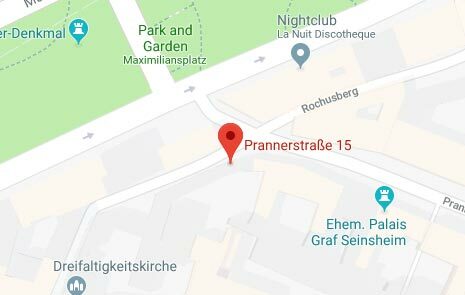 Here, turn right to "Rochusstrasse" and you will see our office at Prannerstrasse 15. If you are travelling to Munich by car, please let us know in advance and we will book a car parking space for you close to our office building.